While the upcoming Amazing Spider-Man 2 evidently deals with the creation of the Sinister Six, the comics are, of course, a little past such events. While comics are bound to circle back to the villainous squad, checking out the most recent events of Amazing Spider-Man are filled with enough changes to make a new reader’s head spin. Why would his head spin because things are different from the movie? I don’t know, I’m not a biologist and science is tricky. So when somebody does pick up the more recent issues, here’s a recall of some of the noteworthy events going on, leading up to The Amazing Spider-Man in Marvel Now! and the film, releasing May 2. The following takes place in The Amazing Spider-Man #698-700. In the story arc, Dying Wish, Otto Octavious, who’s been dying of cancer for some time now, uses a specialized “Octo-bot” to switch his consciousness with Spider-Man’s. Why? Because aside from dying which is bad enough, such a bizarre feat would also be the greatest victory. The body Spider-Man had spent so many years beating on would ultimately be his own casket while Octavious would take over Parker’s life. Unfortunately for Peter Parker, it worked. The once young and super powered Parker is now in the decrepit and withered body of Otto Octavious. Making one last stand before Parker (In Octavious’ body) was done for, he teamed up with his old enemies, recreating the Sinister Six to escape the SHIELD prison and switch bodies back with Octavious (In Parker’s body). But after a long and well-drawn battle by artist Humberto Ramos, including a scene where Octavious finally understands how much Parker has held back over the years where he puts an overzealous Scorpion in his place…by punching the guy’s jaw off. But even with certain realizations taking place, Parker was ultimately defeated by a man in his own body. Though Parker reversed an Octo-bot in an attempt to switch minds back, Octavious showed his true mental prowess by already covering that exit by keep a metal plate around the back of his head and neck, where the Octo-bot does it’s work. Parker was stuck in Octavious’ old body and was literally seconds from death. But in his last moments, both players received mental jolts and in a flash, experienced the others’ lifetime in seconds. The similarities were many, as both had been through an upbringing of nerdiness, an awful social life, and in so many cases, adolescent misery. But where the two differed were their parentage. While Parker had his Uncle Ben and Aunt May as decent and wholesome figures to guide him through, Octavious had an overbearing mother and an abusive father that berated Octavious until his death. It was at this moment, Octavious came to understood Parker’s intentions really had been to protect the innocent; while Otto had always seen him as just another bully, ruining plans and mocking him at his expense. With Peter’s dying breath, Otto vows to not only continue playing the role of Spider-Man, but to be a better Spider-man. With The Amazing Spider-Man series ending(!) 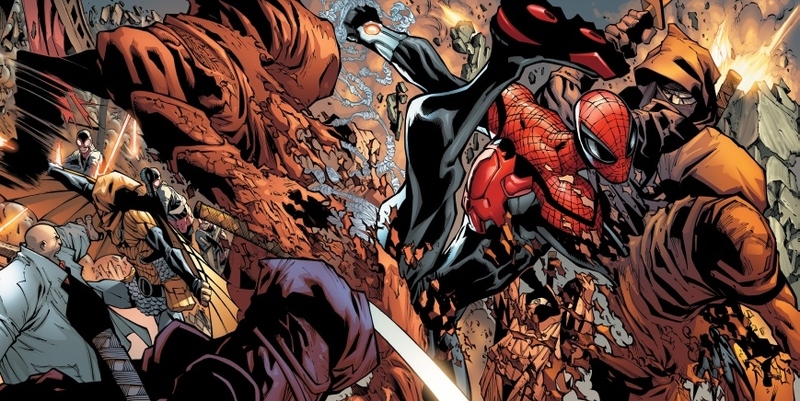 with issue #700, Otto Octavious has taken over the role of Spider-Man, calling himself the Superior Spider-man. Look out now! Superior Spider-Man #1 was released in January 2013, to fall in line with Marvel’s reboot of their entire continuity, known as Marvel Now! The changes for Now! aren’t so much redoing everything you’ve known about the characters and stories, more so continuing what you’ve known already, but on a cleaner slate. As the “Superior” Spider-Man, Octavious proved himself to be a more-than-adequate vigilante, but a poor hero. Thinking the two to be one and the same, Octavious’ only real reason for not sinking back into all out villainy seems to be that Peter Parker is a ghost in his own head, holding Otto back without Otto’s knowledge. All of this was met with diversity by fans. Some were glad Parker never really went away while others called it a cop-out; wishing Peter really were just gone for a while. How can we miss him if he never really left? In any case, Otto focuses on efficiency and results, like the true super villain he is. Changes are made to the outfit such as google-like eyes lenses as well as claws on his hands and toe. It’s the simple things that make all the difference. Oh, and employs thousands of spider-bots all over the city; bug-like robots that allow Otto to have eyes and ears to keep tabs on everything in New York; no crime will go unpunished. Finding out he’s been using children as minions, Otto defeats the Vulture by blinding him with a spotlight (And then throws him into it). With Otto simultaneously shows his moral side and his vicious side. But the vicious side takes over once C-Lister villain Massacre takes hostages at Grand Central Station. 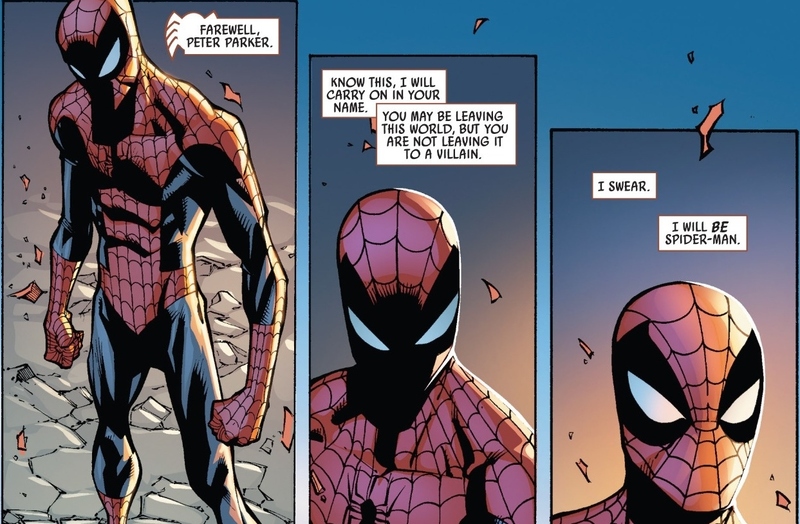 This arc held some of the most poignant ideas in the Spider-Man series in years, as light was finally shed on how someone else would handle the same situations Parker had been dealing with. Otto makes sure to call the police for back-up, which surprises the bit of consciousness Parker has left. Preparedness and giving orders were things the original Spider-man never had a handle on. It was also interesting to hear J. Jonah Jameson (Mayor of New York) talking to Otto, blaming him (as Spider-Man) for the deaths Massacre recently caused. Does the prideful Otto take this reprimanding? Yes, he does; now in Peter’s shoes, Otto isn’t going to deal with things the same way and sees Peter’s promises to keep everyone safe as empty. But once Otto is finally faced with the prospect of putting a man back into prison who’s actions have caused more damage than he could ever repair, Otto doesn’t handle it with the same dignity Parker does. Giving into the pressure of handling things permanently, Otto executes Massacre in front of an audience of spectators. After the public execution and the brutal beat down of a couple of pranksters that embarrassed Otto and took him back to his childhood humiliation, the Avengers call Otto in for questioning. It doesn’t go as planned though suspicion of Otto is cleared when they discover through CAT scans among other tests…that he isn’t a Skrull. A relieved Otto calls them dolts and remarks how fortunate it is that Iron Man is off “gallivanting through space” or he may have actually been caught. 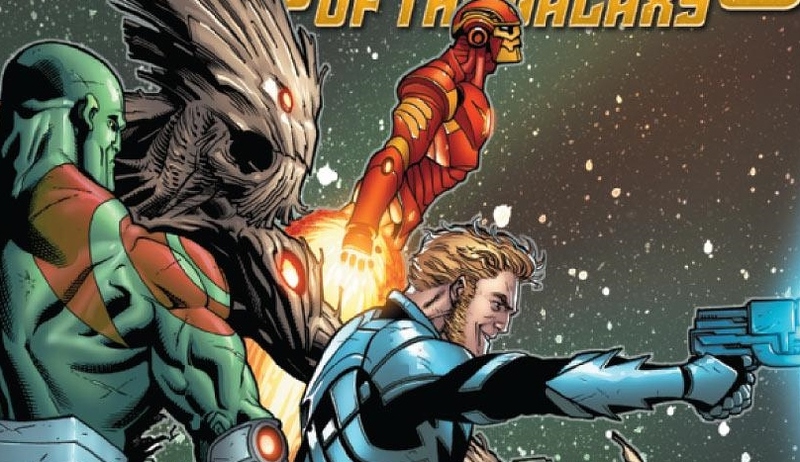 This is referring to the Guardians of the Galaxy issues that feature Tony Stark as a temporary Guardian. Also good stuff. And while the Avengers weren’t able to figure it out, ex-girlfriend Carlie Cooper isn’t so convinced that Spider-Man and Peter Parker are the same anymore. 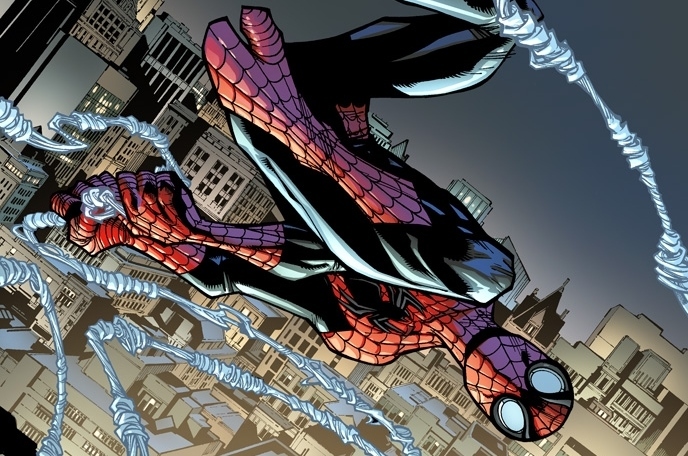 Aside from the above, Parker regularly allows civilians to be hurt in the pursuit of a criminal, something the actual Spider-man doesn’t allow if he can help it. Keeping everything in a journal, she continues her research. All the while, the Green Goblin, whose identity is a mystery, adds to his underground Goblin army in the sewers of New York. 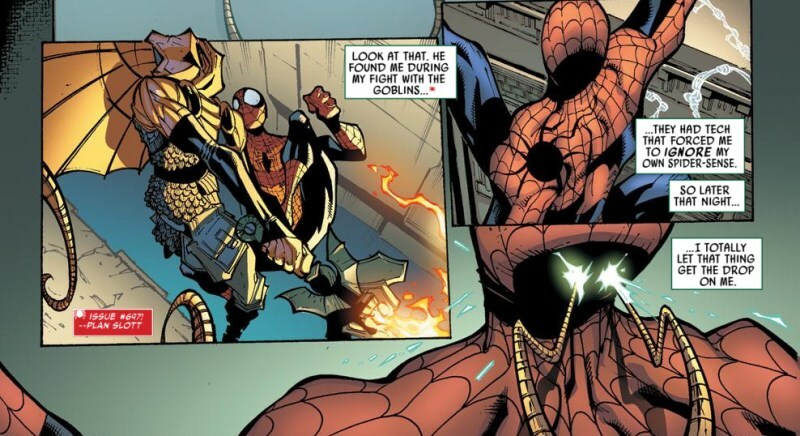 With every villain Spider-Man defeats, Goblin collects the remains and grows stronger. 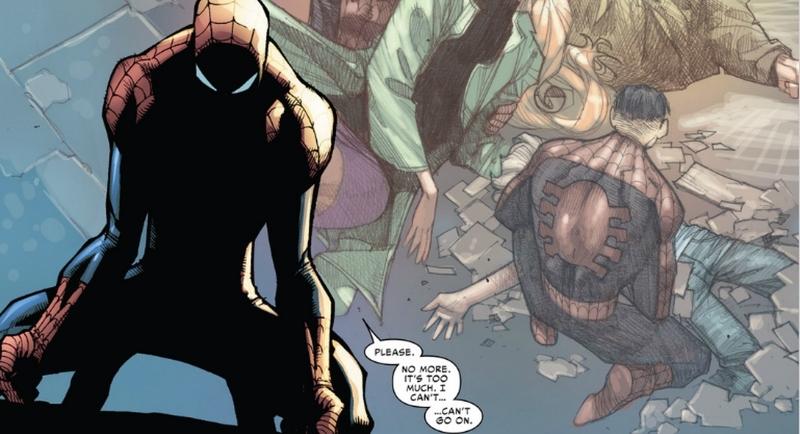 The next several issues contain so much that it almost seems to wipe away much of what Peter had been doing as Spider-man all the years prior. Here’s the short list. Changes his outfit entirely, complete with four spider-legs to extend from his back, a la octopus tentacles. 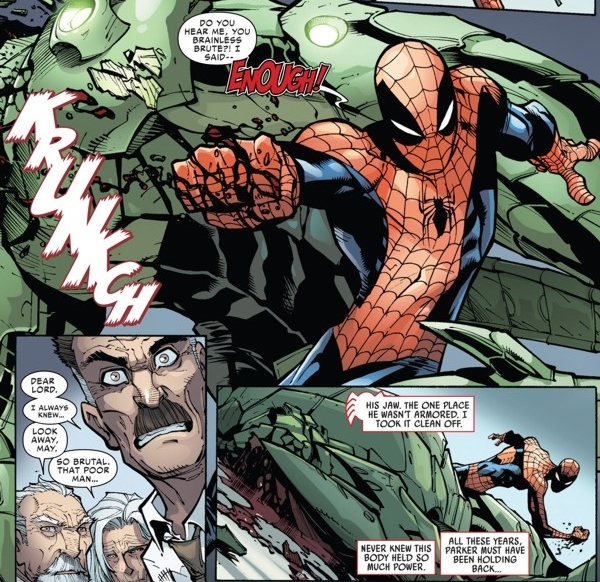 As Spider-Man, Otto kills longtime enemy Alistair Smythe under orders from J. Jonah Jameson, with Smythe even trying to switch bodies; needless to say, it doesn’t work and Otto’s genius planning shines through again. But using a recording of Jameson’s kill-order to blackmail Jameson, he’s “forced” to give the prison The Raft to Otto as a base. With the help of newly employed minions and Spider-tanks, Otto takes out the Kingpin’s territory, the Shadowland, defeating an army of Hand Ninjas, and making Hell’s Kitchen safe again. He also uses a city-wide broadcast to announce a Hobgoblin’s identity in order to catch him. It ultimately works, though the Green Goblin simply adds the Hobgoblin to his army. Spider-Man 2099 travels back in time and many of the 2099’s key elements in his own time happen on Otto’s watch. Spider-Man’s tumultuous relationship with Black Cat is dealt with plainly and simply when he meets her. Viewing her as nothing more than a criminal, he punches her in the face and leaves her webbed up for the police, swearing revenge. The resolve! 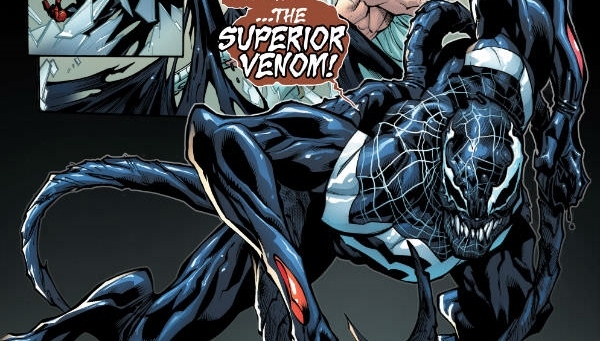 But one of the best parts of the entire run must be when the symbiote suit (now worn by Parker’s former high-school bully Flash Thompson) takes over Parker’s body to create Superior Venom. He’s eventually defeated by the Avengers whose suspicion has risen again as to what’s wrong with Spider-Man. Carlie Cooper, whose look and behavior resemble friggin’ Velma from Scooby Doo, is captured by the Goblin Army. 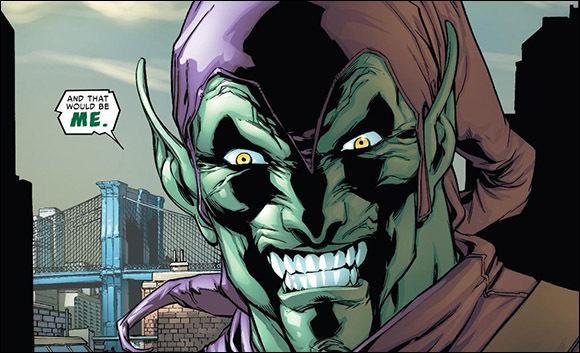 The Green Goblin, claiming to be Norman Osborn, turns her into a goblin as well as finding out Spider-man’s secret, that he really is Otto Octavious. With Peter Parker having found a corner to dwell in inside of his own body, he’s grown stronger by the day until his consciousness is finally ready to expand and take his body back. While this is easier said than done, Parker’s body is being tormented by the Green Goblin’s “sudden” return right under Otto’s nose. Cutting off all of Otto’s escape routes and evidently having figured out the meticulous but “predictable” Otto, defeat seems imminent. And then…finally…at long last…Otto admits that he can’t do it. He can’t be the hero Parker had always been. 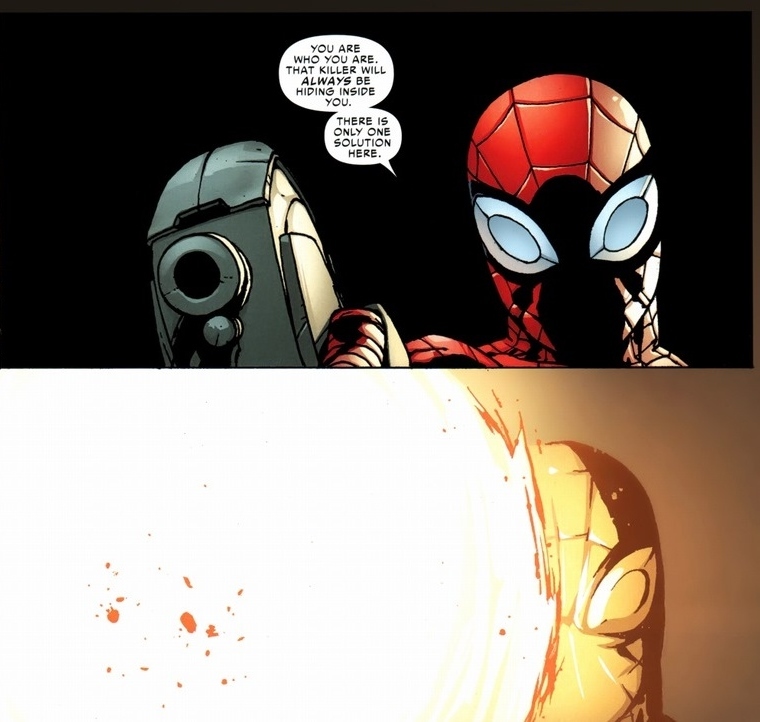 He willingly allows his consciousness to be erased to give the real Peter Parker full control of his own body. After the final confrontation between the Amazing Spider-Man and Green Goblin, Spider-man is the successor. 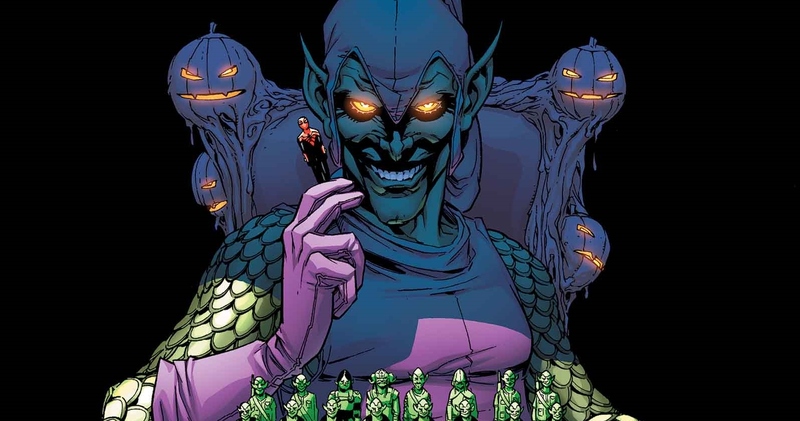 Though the Goblin is unmasked and still claims to be Osborn, his face is different, the reason he claims is that his own face is too well-known and for Osborn to prepare a future for his family, he needed to go unnoticed. Almost predictably, he escapes. But his family legacy has been secured with Alchemax industries being set up for his grandson, and as Osborn hopes, to carry on the Osborn name. 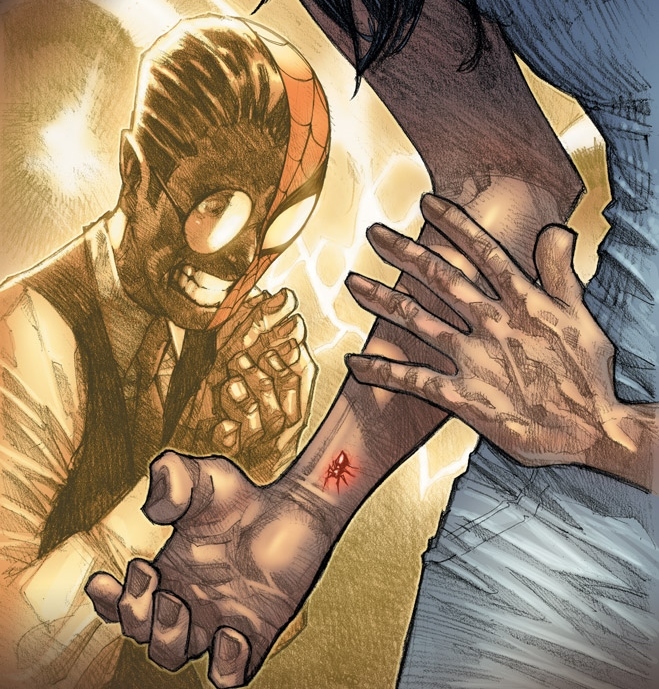 But more interestingly, it looks like Peter Parker wasn’t the only student bitten by the radioactive spider that changed Parker’s life. 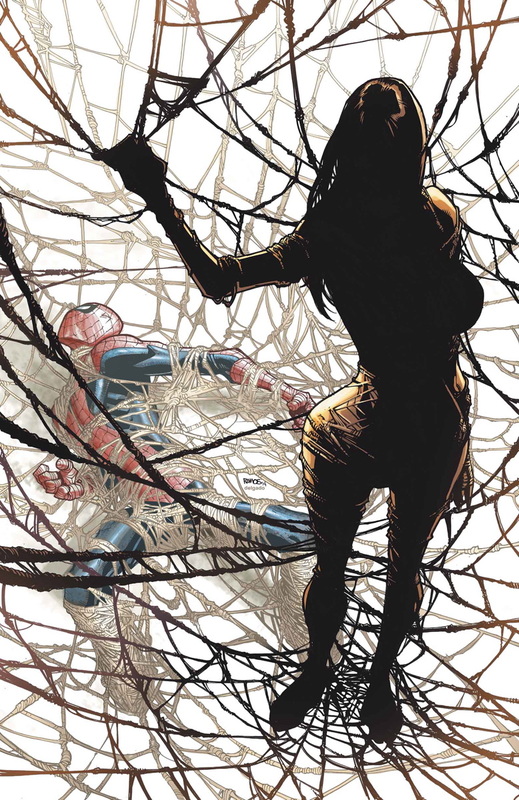 Known as “Silk,” it looks like she’ll be making her debut and trouble for Parker in this most recent issue, due out Wednesday, April 30, 2014. The timing! Here’s an interview with the writer of it all, Dan Slott and some related links below. 7 Things Spider-Man is Getting Right– A look at the many fun events of Superior Spider-man up until issue 22, including the Wolverine beatdown. Not an overview. 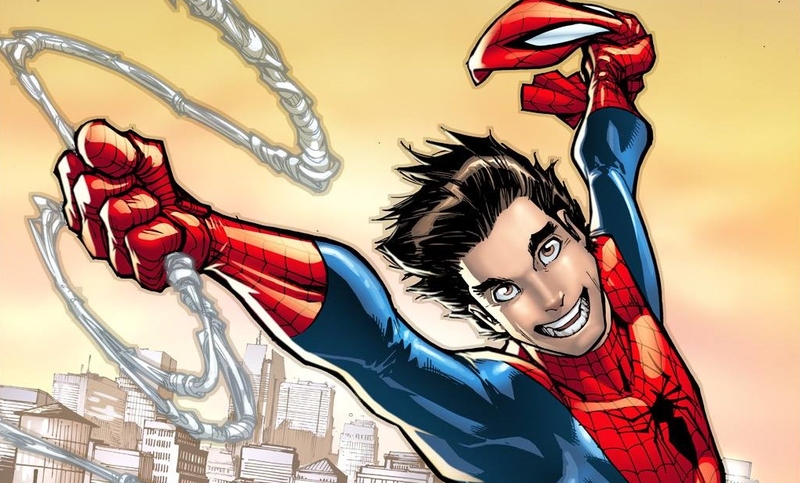 It Took Me 25 Years to Realize Spider-man is the Greatest Superhero– An argument for Spider-Man being the most inventive hero to grace comics and pop culture overall. 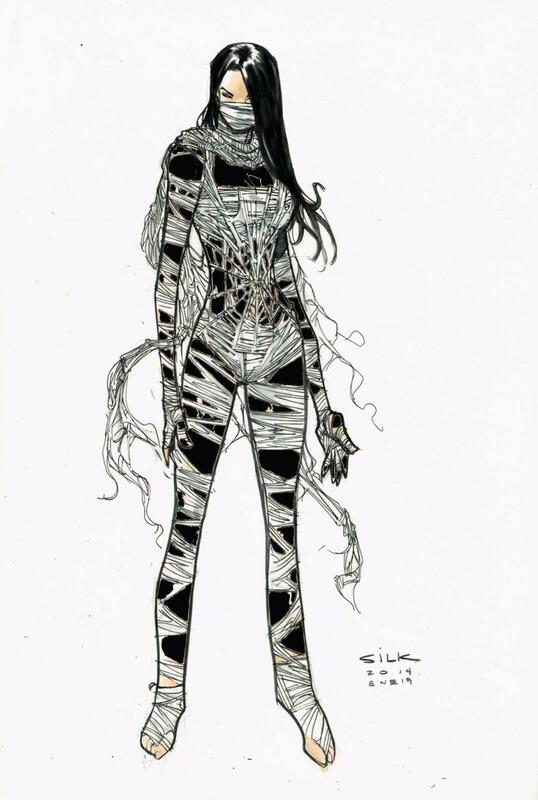 This entry was posted on 04/29/2014 at 3:04 am and is filed under Whatever with tags amazing spiderman 2, dan slott, humberto ramos, overview, rundown, silk, spider-man marvel now, superior spiderman, superior venom. You can follow any responses to this entry through the RSS 2.0 feed. You can leave a response, or trackback from your own site.